Dust in the wind . . . and in every nook and cranny, too! 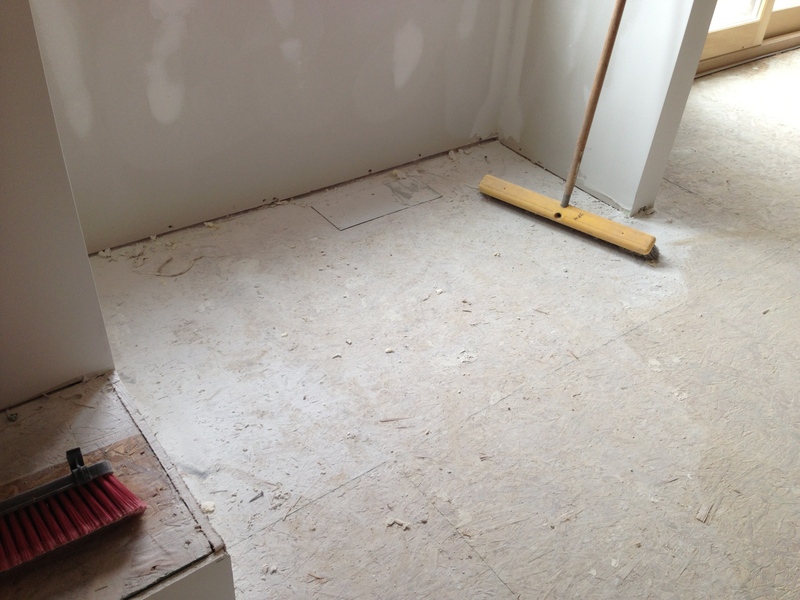 Yes, there is dust, dust, and more drywall dust in our house. Not sure why we didn’t sub out the cleaning of drywall dust. It’s bad. And, it’s not a fun job getting rid of it. 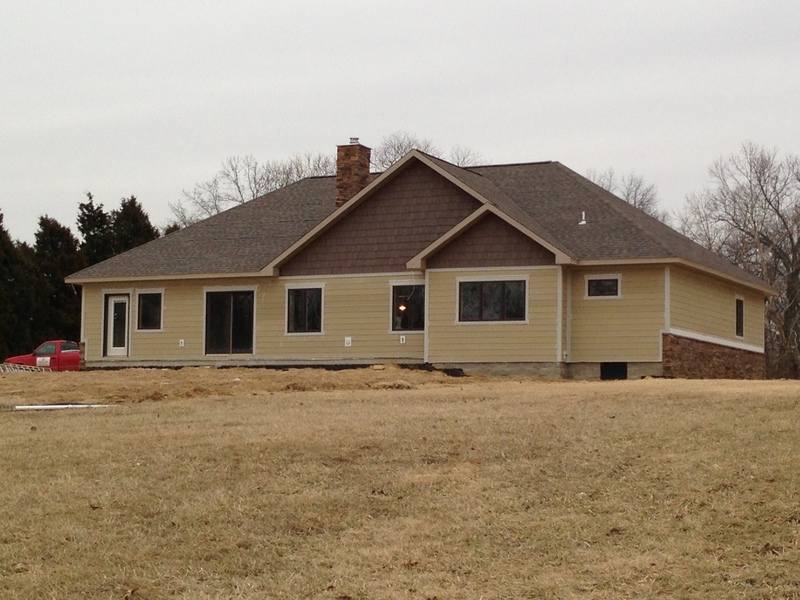 Tuesday, January 28, I got an email from Mark from Fehrenbacher Wood Specialties that our project was ready to ship. He asked if the weather had slowed any of our contractors down. He said he could hold our trim, beams, and interior doors for a little while if we needed him to do that. “Yes, please!” I quickly replied to him. Bill immediately got on the phone and called Bart, the drywall owner, and told him they needed to be out of the house by Monday, Feb. 3. That did the trick. The mudders came Wednesday and Thursday. 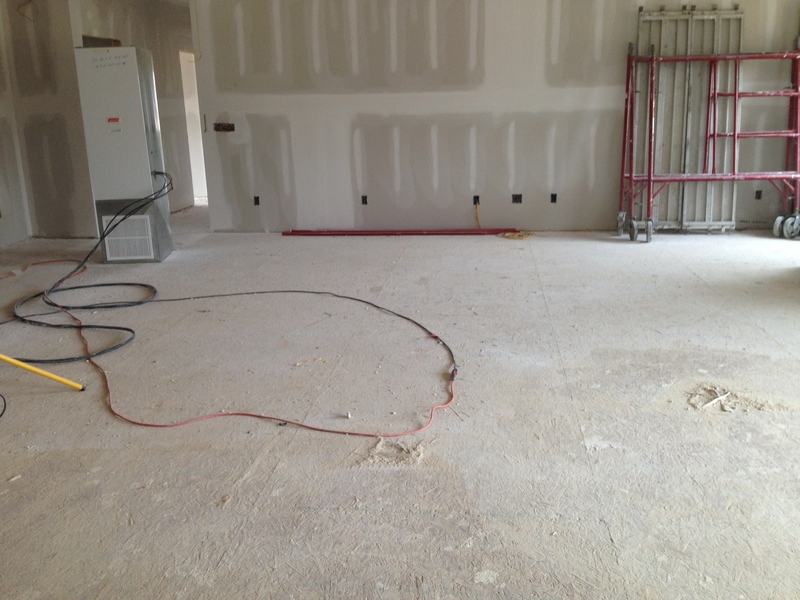 We had yet another drywall crew who came and worked all day Friday to do the final sanding in the house. 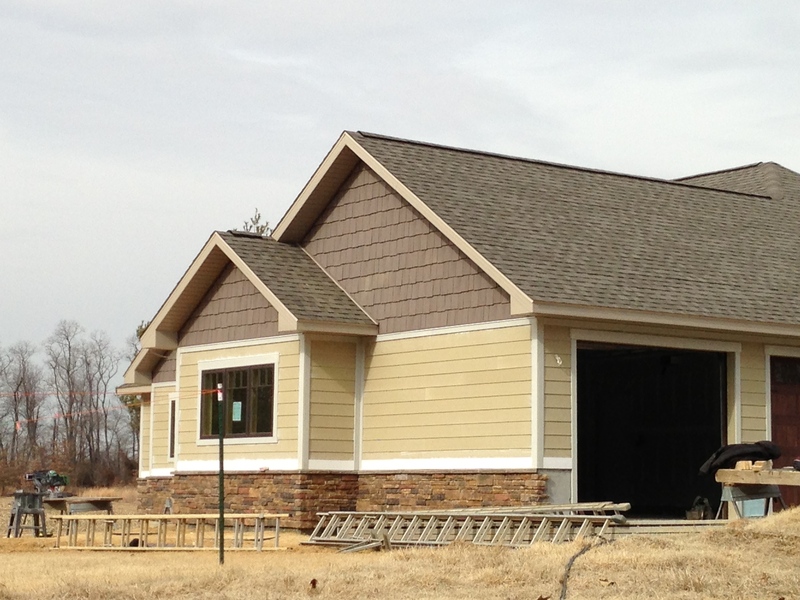 The siding crew worked Wednesday and they were getting more and more siding out of the garage. For some reason the mudders only did a bit in the garage and told Bill they needed a different tool to mud the garage. Bill just shook his head. Not sure what tool they would need special! ❓ Drywall is drywall, right? 🙄 Who knows when they’ll come back to finish the garage. Okay, back to the drywall dust. 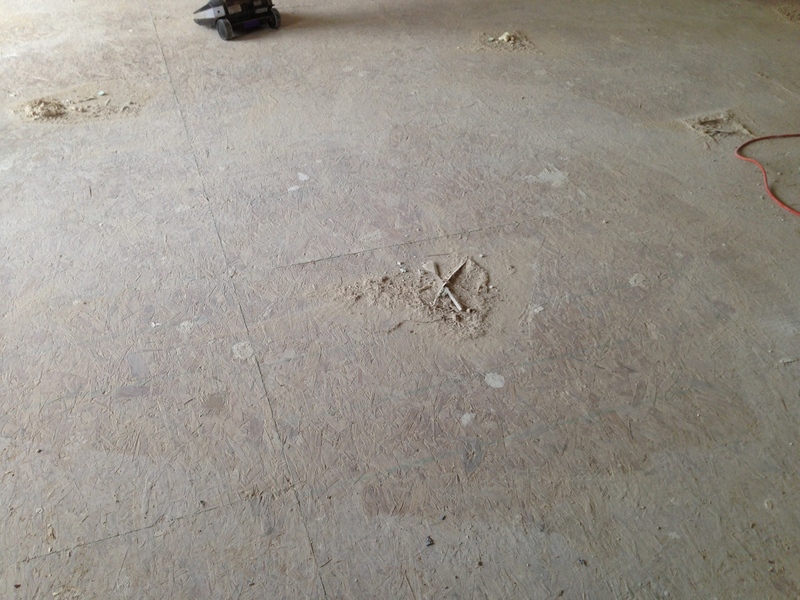 Cleaning this drywall dust and excess mud was something else. I do not know if what we did is helpful to anyone else or not. I don’t know if there was anything that would have been a better or faster method. All I know is what we did. It appears to have worked out okay so far. Here are the steps we took. First Bill took a large dust mop and ran it over the walls and whatever ceilings he could reach. 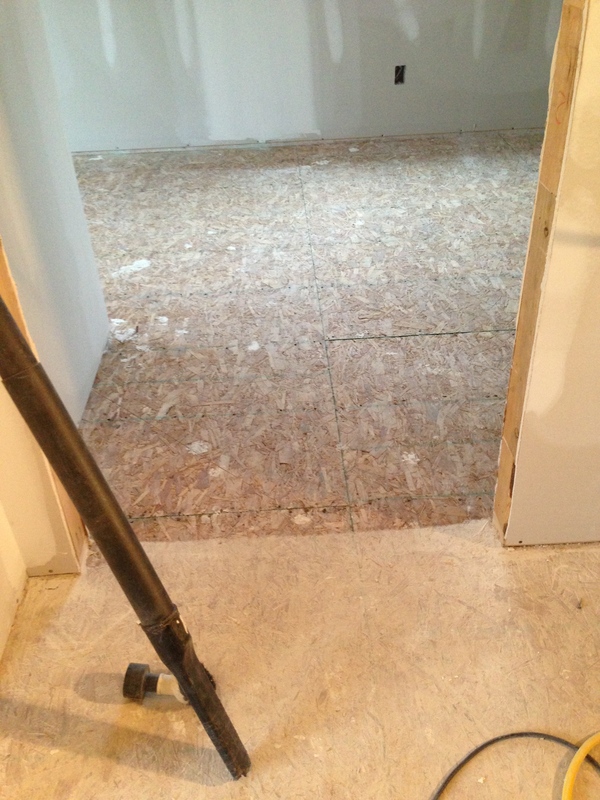 Then I swept each room into mini drywall mud and dust piles. 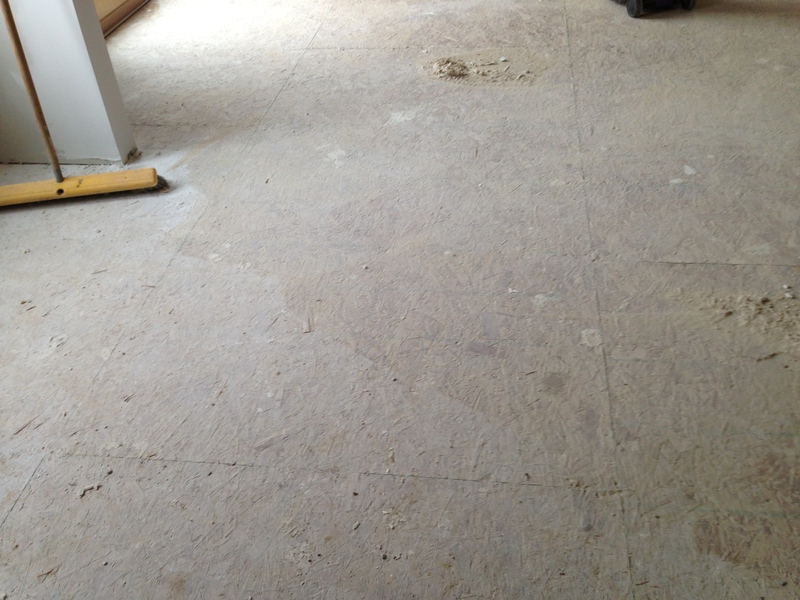 Here is what it looked liked after I swept mini piles of debris and dust. Notice that it doesn’t even look like I swept the dust! I used three different brooms and still got the same results. I went back throughout the house and swept the piles into our snow shovel which we used as a dust pan and then into the trash can. We bought drywall dust filters for the shop vac. Highly recommend those. I think Jill and Jim messed up their shop vac during this phase of their build. Bill then vacuumed all the window sills, around all the corners, and all the openings for light fixtures or outlets. 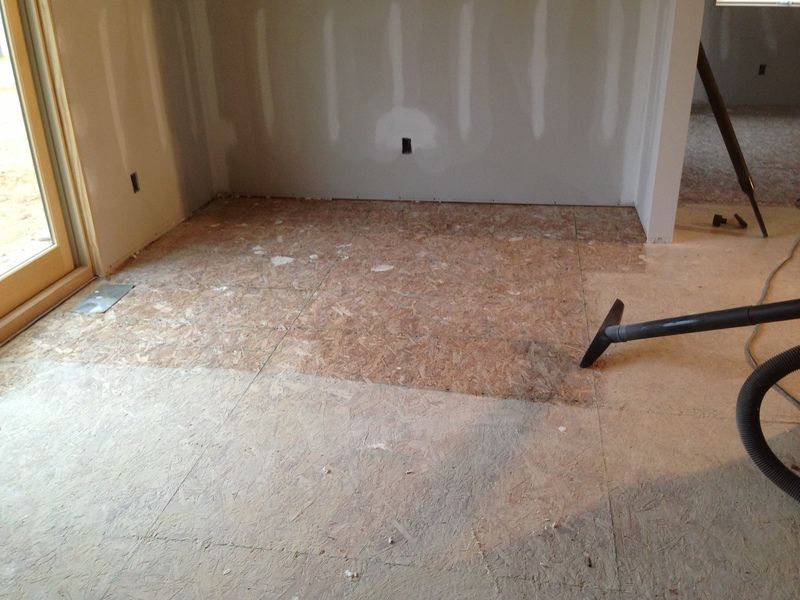 Then, he vacuumed the laundry, kitchen/dining and family room floors with the shop vac. He’s on his second shop vac filter. He may have to buy another one to finish the bedrooms and baths floors today. I tried to help out by vacuuming, but that’s when my back gave out for good! Ouch!!! Like the video, the pic below shows the bottom part AFTER I had swept and picked up with a broom and the snow shovel. The top part shows after Bill swept with the Shop Vac. Bill & I both agree that the process is a back breaker. As I sit here nursing my back, Bill is down at the house vacuuming the rest of the house . I’ve already emailed Mark at Fehrenbacher to let him know he can deliver the trim package anytime. Yay! 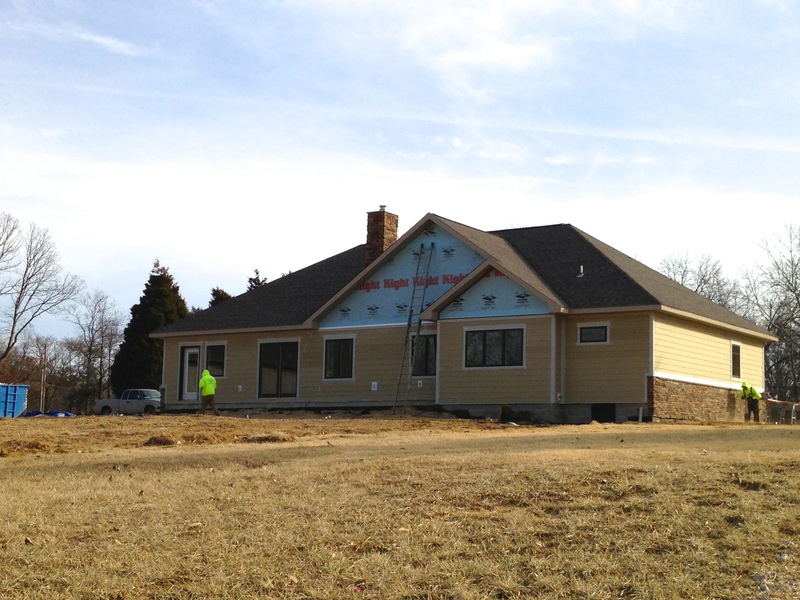 The other good news this week is that the siding guys finished up yesterday! 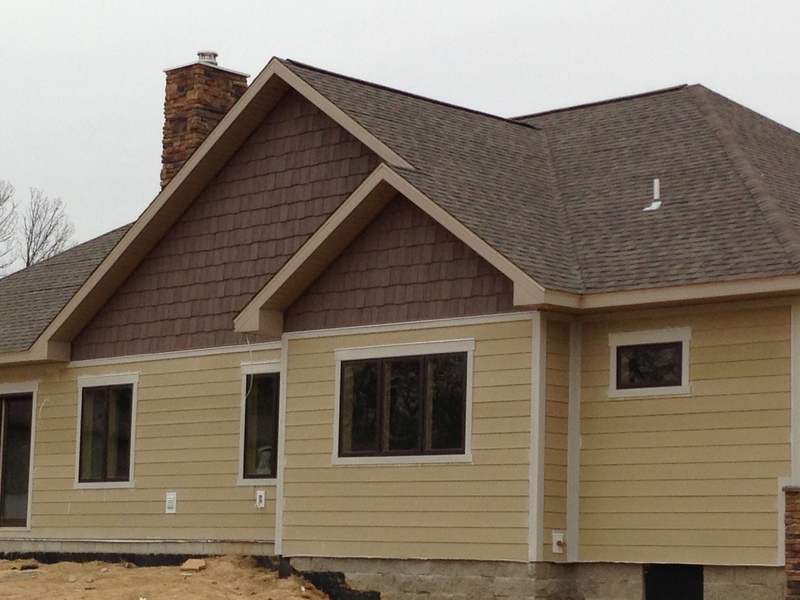 Now, remember, this is NOT the color that the siding will be. 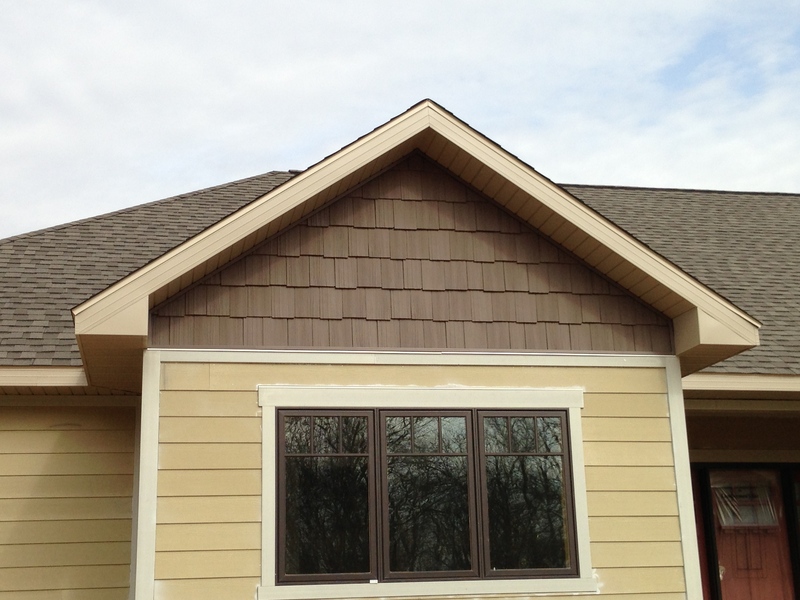 Hopefully, we are aiming for the color to be the same as the clay-type color (official name – Norwegian Wood) of the soffits and fascia (shown on the gables). Looks like they knocked off the stone ledgecap on the corner. Oops, that shouldn’t have fallen off! 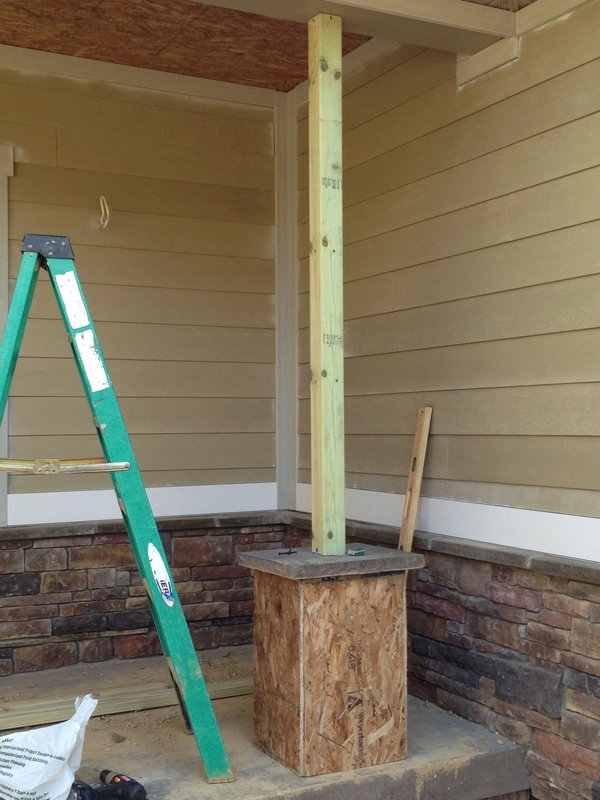 So, while the guys were working on the front porch area, Bill decided he did not want the fascia material on the porch ceiling. He said he would prefer having tongue and groove beadboard. 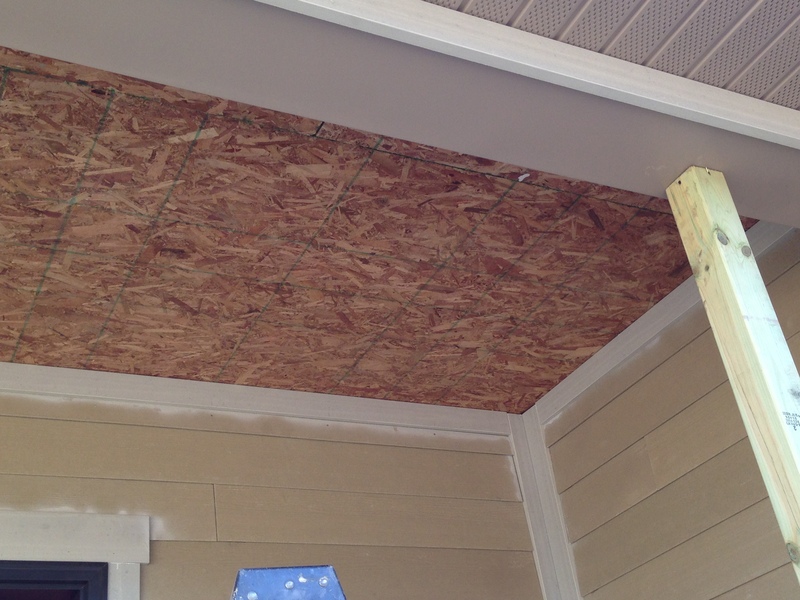 So, Bill had the siding guys install osb on the porch ceiling. Yesterday morning, Bill and I went to Menards and bought pine beadboard. We are going to have the painter stain it to match the front door (mahogany) and we’ll have the trim carpenter install it. I’m excited! I’ve always liked the look of the stained beadboard (never told Bill that) and would never dream to ask for that on the porch. I’m so glad Bill suggested it! 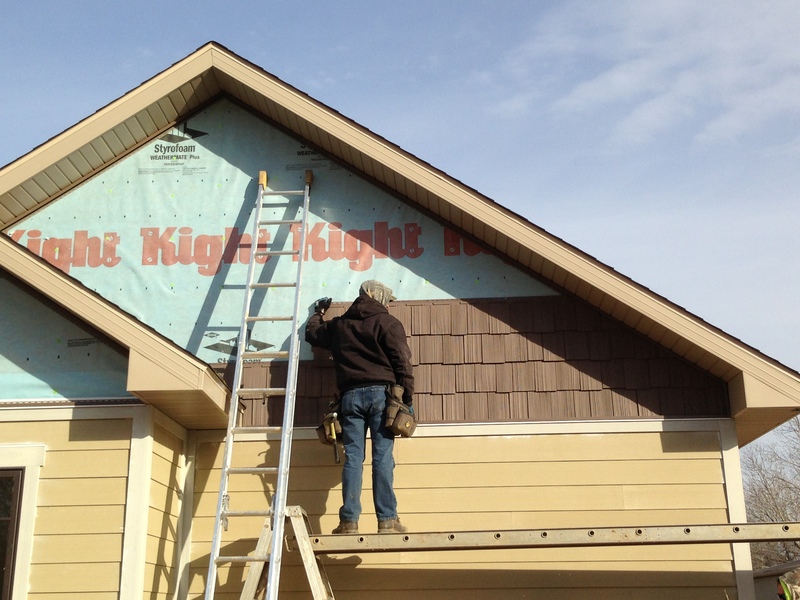 Friday the siding guys started and finished the installation of the shakes in the gables. 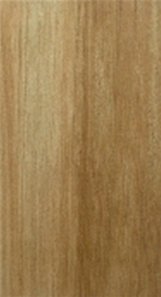 They are Certainteed Cedar Impressions 9″ Double Split Edge Staggered Shakes in Sable Brown. So happy with the looks of them. And, the back all done! 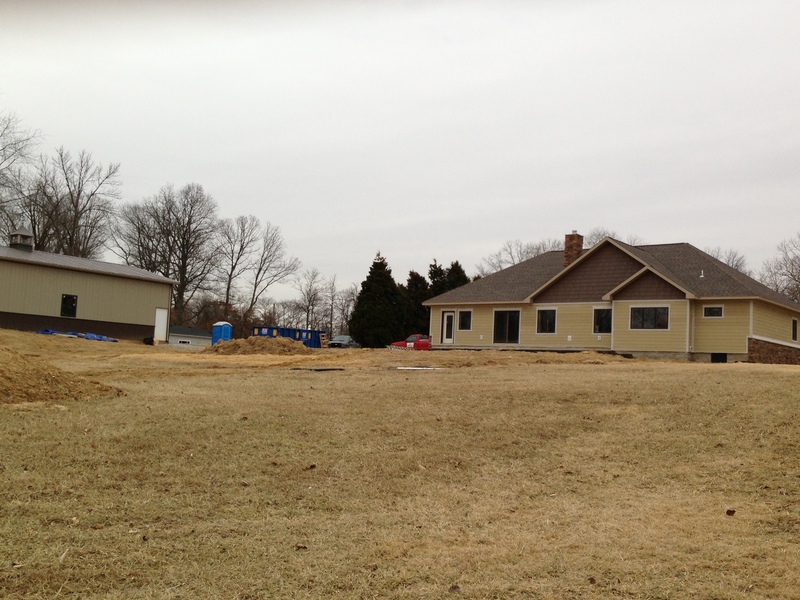 Here’s a view of our house and pole barn driving from Jill and Jill’s house. 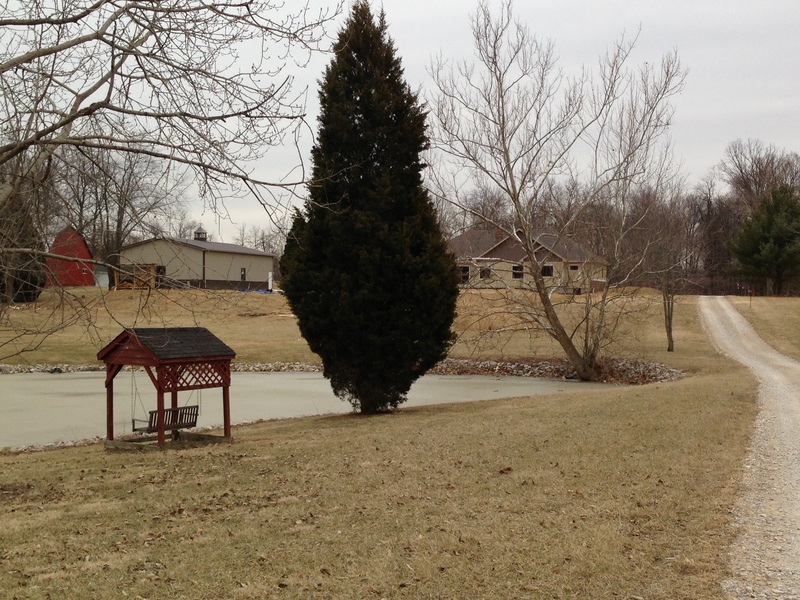 You can see Jim and Joan’s red barn to the left of our pole barn. The guys started working on the columns and Bill had me approve the height before they built the second one. 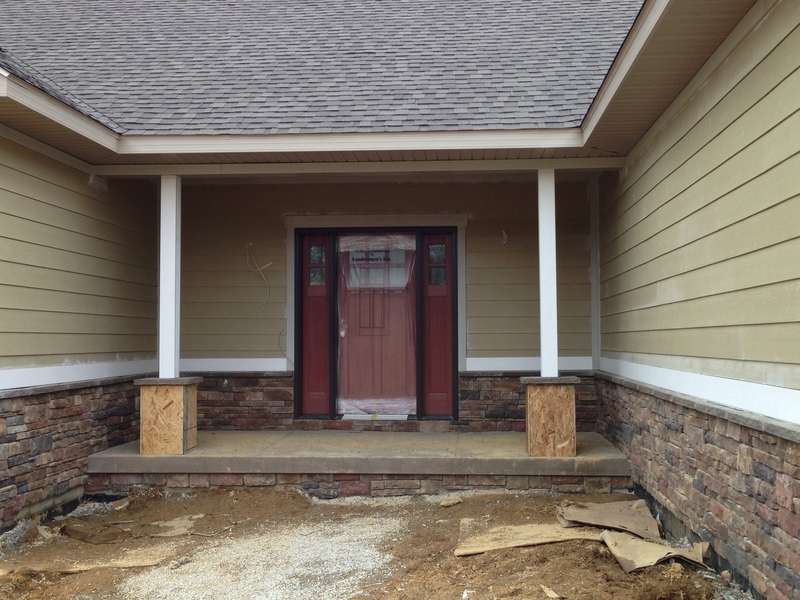 Originally, we were going to have larger columns, but I felt they were going to take over the front porch. I wanted to have room to maybe put a chair and table or flower pots or whatever. If we went with the larger columns, I think that is all you would see. So, back to houzz.com to look at columns – sizes and shapes. So, this is the size I chose. 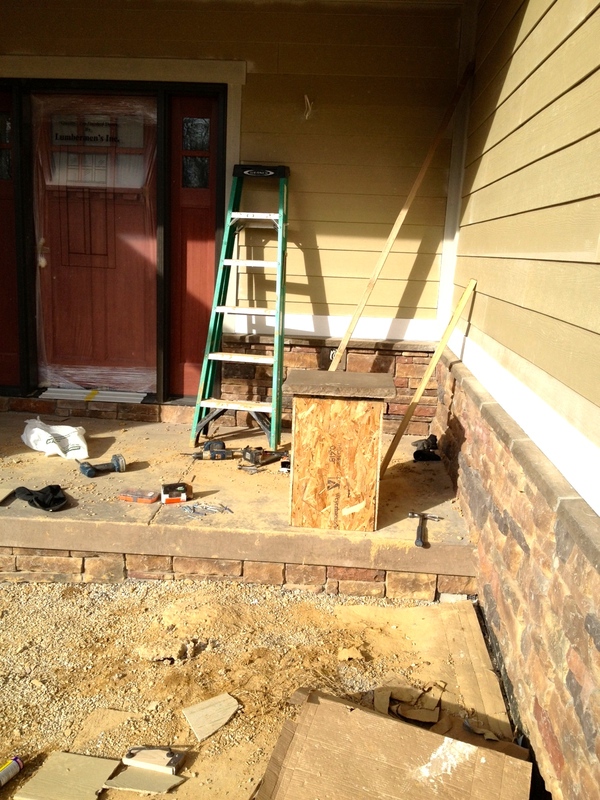 The guys finished up building the columns on Saturday and covered the wooden posts with the wood grain cement board trim. The stone guys will stone the columns on their next trip back here. We’re going to have the painter paint the posts in the bronze color. 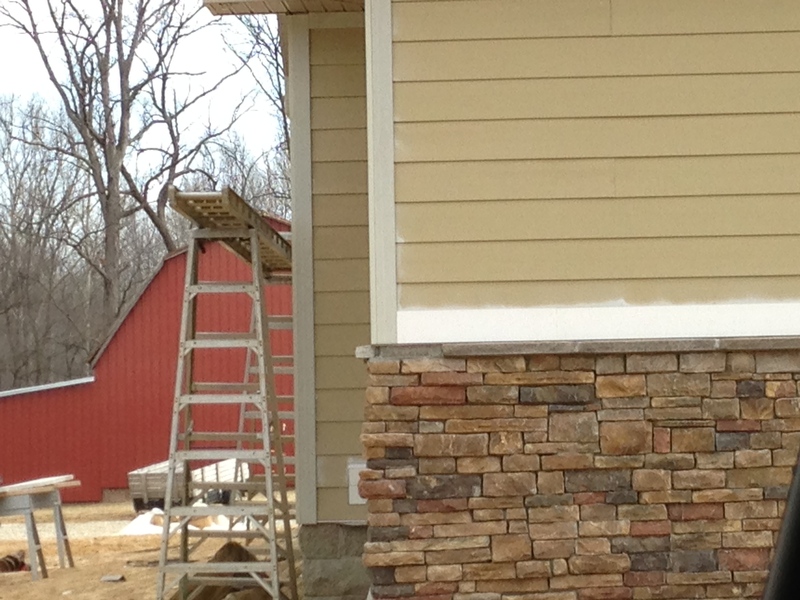 Bill is going to call Rick, the stone guy, either this evening or tomorrow and tell him that we are ready for them to finish the exterior stone work and to begin stoning the fireplace surround. 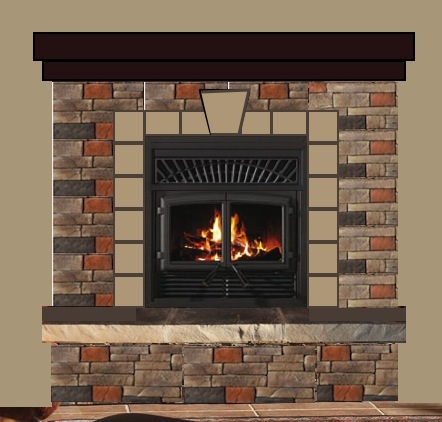 I can’t wait to see if the fireplace surround design I created on my computer will look okay. I’m no designer. Never done anything like this before. We’ll see how close they come to this. Since the weather was so cold on Monday and Tuesday last week and Bill could not work on the cabinets, we decided to get some other things accomplished. On Monday Bill and I made a trip to a store called Finders Keepers in Princeton. We had seen a carved top table in that store once and we thought maybe it could work for the other side of our entryway when you came in from the garage. I was looking for something we could use to put mail, store keys, set land-line phone (if we decide on that) and maybe where we could plug-in our cell phones and iPad. I had already decided I wanted to put several hooks on the short wall where I could hang my purse and maybe a jacket. 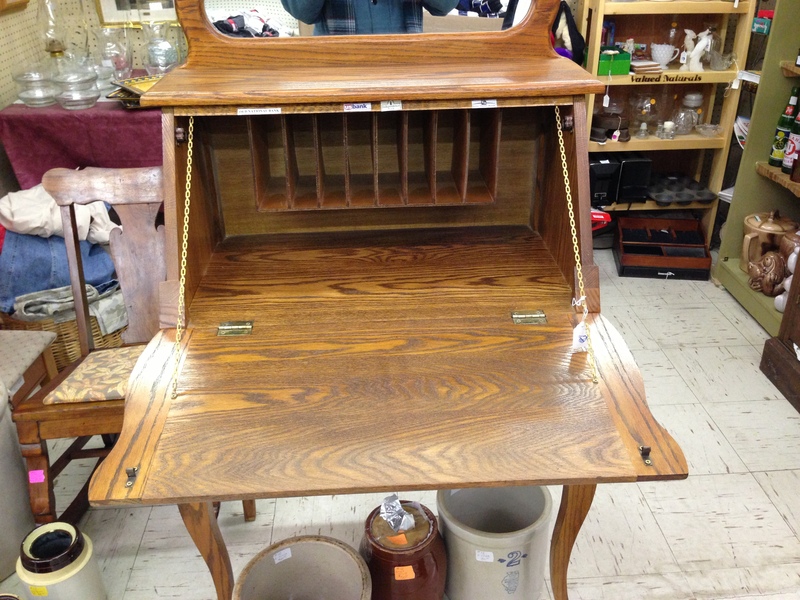 We ended up finding a unique antique desk with a drop-down top. Bill is going to strip it and stain it a darker stain so it will blend in with the new chest we purchased for the other side of the entry. I’ve also convinced him to cut off the mirror at the top. He’s not happy about that, but I don’t like it. He said he could use his router and put a nice edge on the back to match the edge on the front. 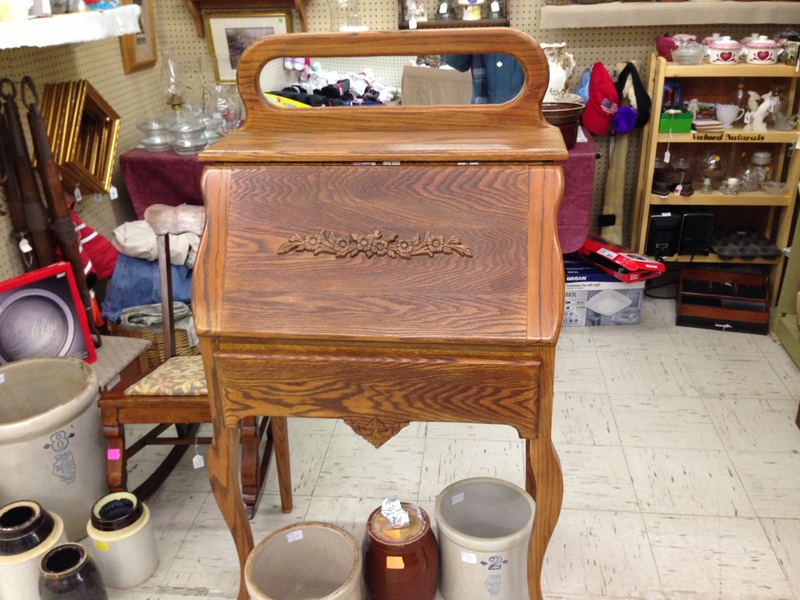 It also has a large drawer under the drop down section. What I mainly like about the piece is its smaller size and it basically has all the functions we need for the space. Not a big fan of oak but with a darker stain, I think it will be perfect! 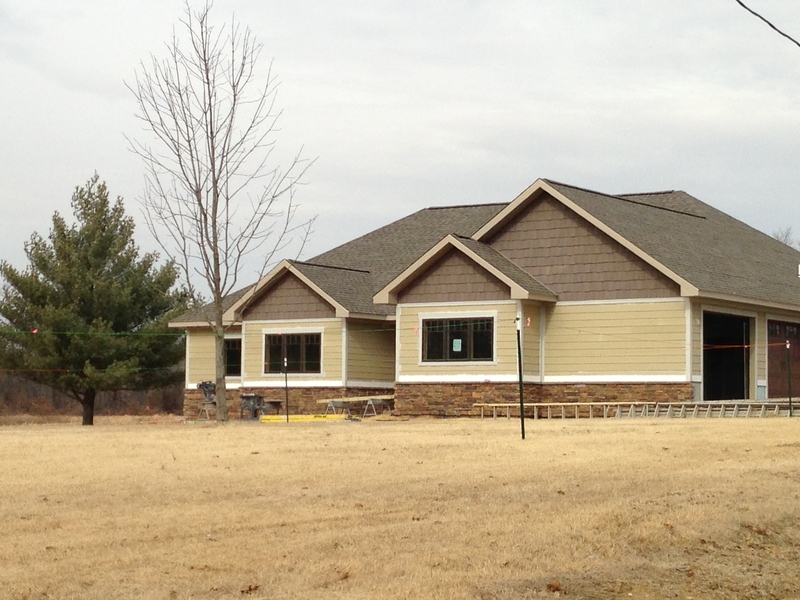 Tuesday, Bill and I had an appointment with Brian at BK Flooring to finalize our flooring and tile selections. We made two changes. Bill liked the tile color I had selected for the hall bathroom better than the one I had selected for the master bathroom. So, long story short, I ended up making the tile in both bathrooms the same. It really wasn’t a big deal. The spare bathroom only has tile on the floor. It’s not that big a room. The master bath has tile on the floor and a tiled shower with a bench. We are using four different tile shapes and sizes in the shower/bench and will use the same tile on the floor as the spare bathroom. The cost for the tile didn’t change since it was just a matter of color change. However, the change did involve our granite choice. So, I had to call Lee, granite guy in Indy area, send him an update of our vanity drawings and get a quote for the Golden Sand granite for the master bathroom vanities (same as what we were using for spare bathroom). You might know the Golden Sand was a higher grade granite than the one I originally had picked out for the master bathroom. I had Lee send me pictures of other granites that would be in the same price range, but the colors were off. I had the Golden Sand sample piece and it had specks of green in it which I liked so we decided we knew it blended in well and I didn’t want to take a chance on something I might not like later. 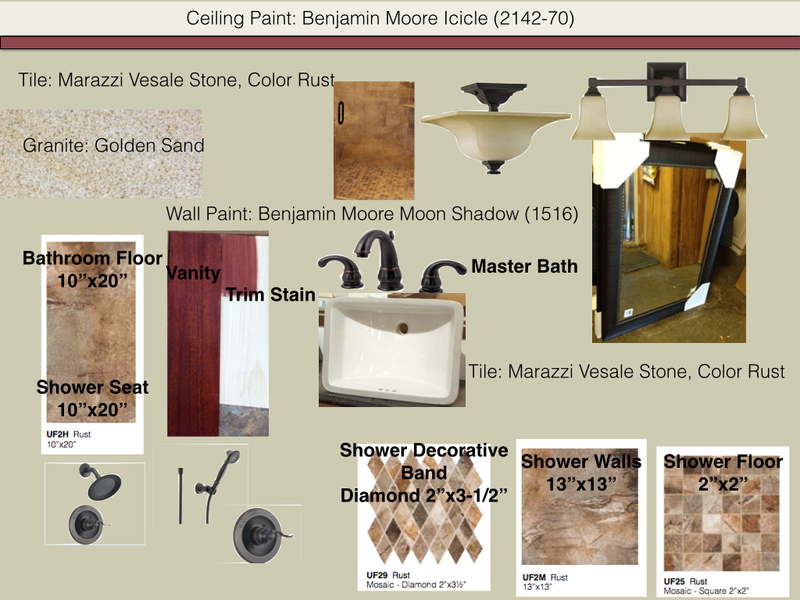 Here’s what the master bath mood board looks like. The second change was the flooring for the large laundry/pantry/computer room. We decided to go with Congoleum Duraceramic Dimensions Blend 12×24 Luxury Vinyl. We are not going to use grout in-between the tiles. I was looking for something warmer and softer to stand on versus ceramic tile. Plus, it’s a laundry room! Oh and Bill has started cutting wood for our kitchen island. He decided he wanted to glue up the kitchen doors in the house after the drywallers were done. So until that happened, he started on the island. Here are the views of what we designed. Bill has some ideas of how he is going to frame it all out. 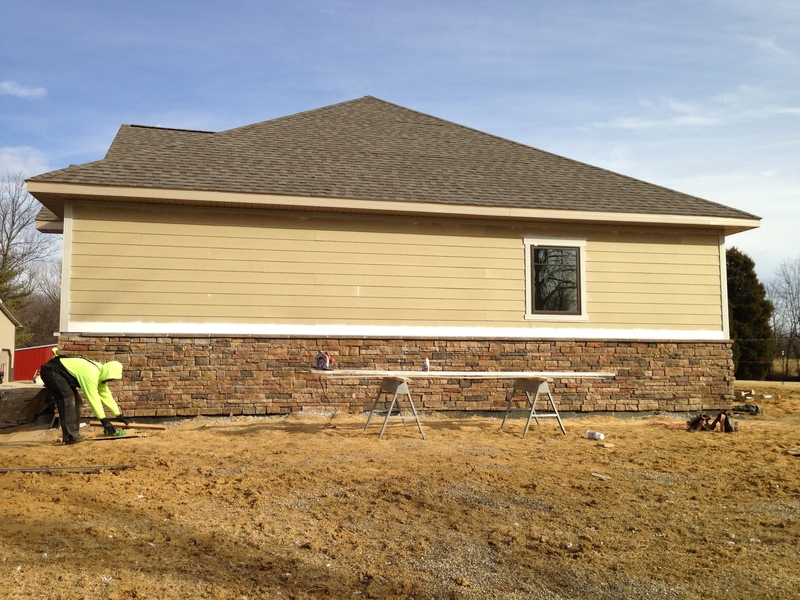 As soon as our trim package has been delivered, we will call the painter and see how soon he can begin staining and painting. Darn that Punxsutawney Phil and his prediction. I guess we’ll just plug along with this crazy winter weather. 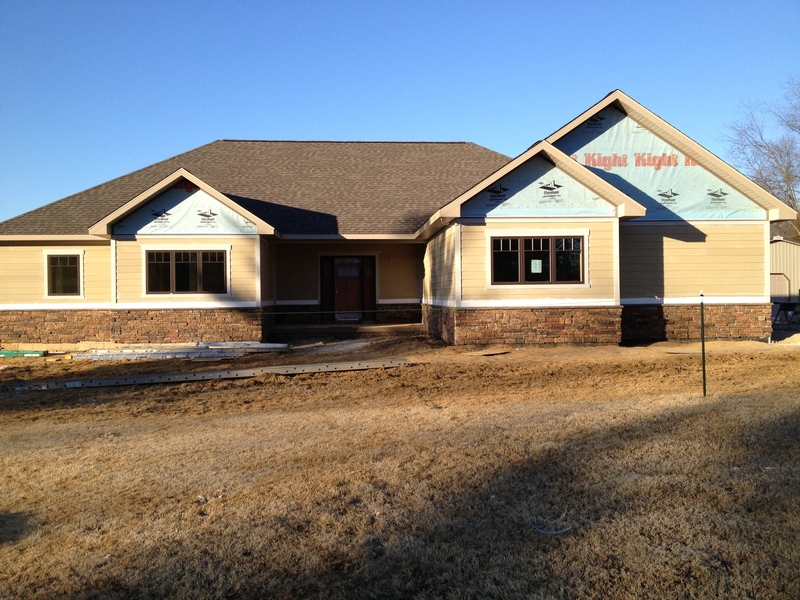 However, since we have the exterior of the house almost done, maybe we will be okay and concentrate on the inside.